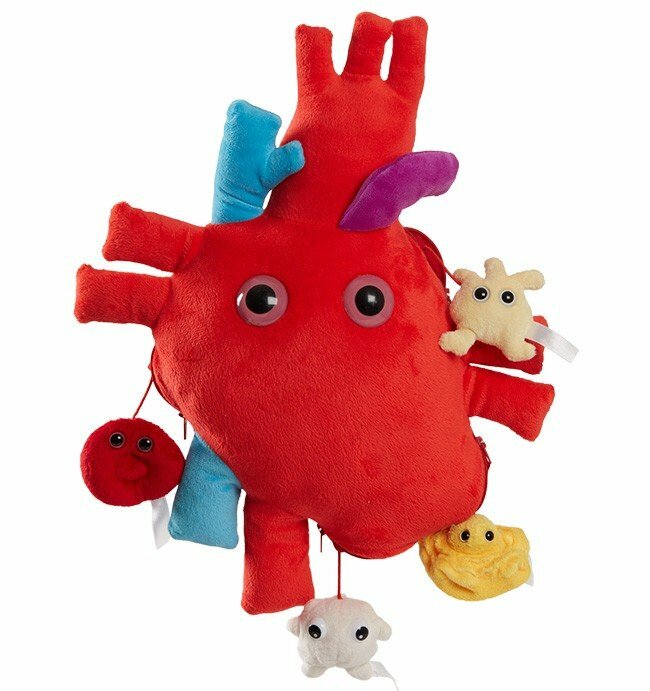 Heart XL Size with Minis under a microscope! 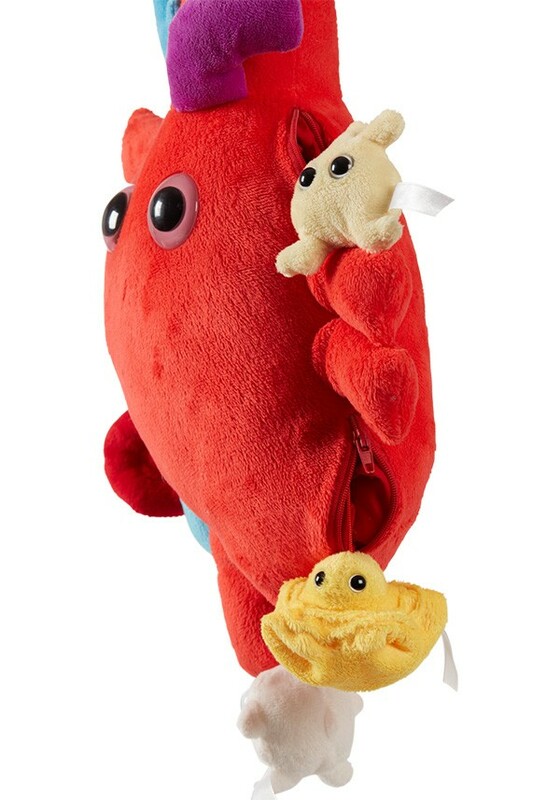 Heart XL (38cm) includes pouches that hold Platelet, Plasma, Red Blood Cell and White Blood Cell minis! FACTS: The heart has long been considered the center of the body, the seat of life, will and emotion. Every culture in history has recognized its essential role in sustaining life. The Egyptians believed the heart to be the center of life and mortality. The ancient Greeks believed it held the soul and the source of body heat. Early Americans recognized the heart to be vital to life. 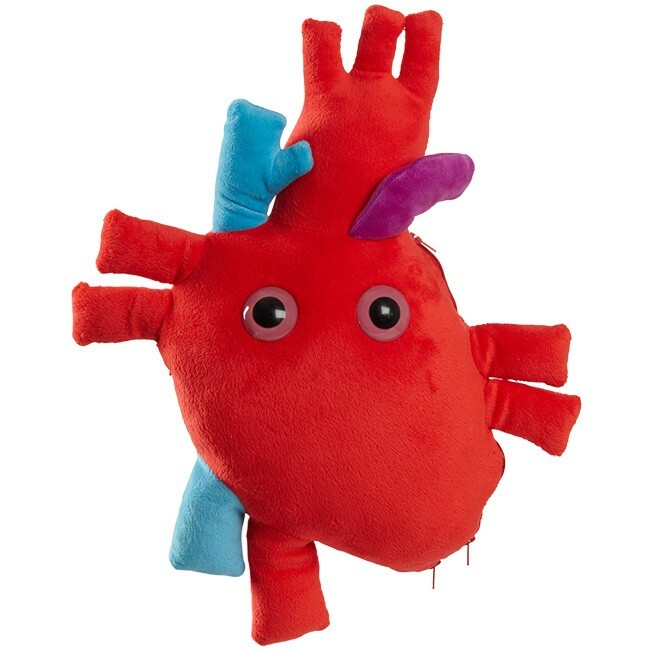 Weighing in at about 10 ounces, an adult heart is about the size of your fist and consists of four chambers: the right atrium, right ventricle, left atrium, and left ventricle. 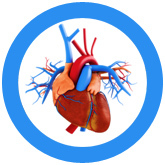 Blood flows from the right atrium, to the right ventricle, and to the lungs to become oxygenated. Blood then re-enters the heart through the pulmonary veins to the left atrium, then the left ventricle pumps it through the aorta out to the body. The human heart pumps blood at a rate of 60 to 100 beats per minute through the 60,000 miles of blood vessels packed in your body, delivering oxygen and nutrients to your organs and cells. That’s like traveling around the world twice. Your heart beats about 100,000 times in a day or 35 million times in a year, a lot of pumping for one lifetime. So the next time your Valentine asks how much you love them, you can tell them “A million barrels worth and 2.5 billion heartbeats”.